A while back I decided to have a go at creating a bit of a console mod, I had no intention of taking apart my original SNES and giving it a lick of paint without first experimenting. 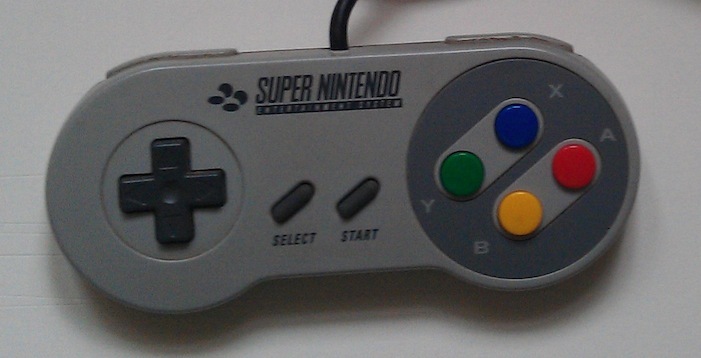 After routing through boxes of retro consoles and accessories in my loft I came across a SNES controller with a broken shoulder button. I decided this would be my guinea pig and if it failed I hadn’t lost much. After taking the pad apart I found the problem – the shoulder button had snapped so I repaired that with a bit of super glue. I gutted the pad and removed the circuit board then washed all the plastic and rubber. I had to spend far more than I originally thought, I ended up with a pack of sandpaper of varying grades, a face mask, a can of white plastic primer, a can of white spray, blue spray and finally a can of lacquer for the finish. In total that lot came to about £40. Take the controller apart with a standard screwdriver. No “gamebit” screwdrivers are required for these controllers. Wash all plastic and rubber parts in hot soapy water. This process should be done in stages, starting from rough sand paper such as 120 then onto 400, 600 and finally 1200. Use a plastic primer spray. You should give the pad 2 or 3 coats, leaving at least 15 minutes between each coat. It is also a good ideal to gently go over the primer with very fine sandpaper (1200) to smooth out each coat. On with the colour, I chose white and dark blue as I wanted to compliment the original SNES colour scheme. The pad will require about 3 coats of paint; this process is similar to the priming stage but you should leave a few hours in between each coat of paint. Preferably leave each coat to dry overnight. After each coat sand down with a fine grade sand paper, again 1200 is probably the best for this. The final stage is to spray the controller with a clear lacquer. Use 2 to 3 coats and allow time to dry in between each coat. Spray in a garage or dust free area. I don’t have access to a garage so I waited for dry, sunny days. Unfortunately, even with the relatively calm weather each coat of paint still ended up with tiny dust and dirt particles being attracted to it. The A,B,X,Y grey section of the controller is actually a sticker, not a clip on face plate as I presumed it would be. I had already started trying to remove the supposed faceplate so I continued removing it and reapplied it with a coat of super glue. I used masking tape over this section to preserve the original design but the blue spray with a grey sticker really didn’t suit so I removed the sticker. This resulted in a scratched up mess where the sticker used to sit. This proved difficult to smooth out with sand paper, so if you look at the final pictures of the controller you can still see an awful lot of scratches. Choose a colour and stick with it! Originally I wanted the entire controller to be blue but after the initial spray I thought the blue front made the controller look like a cheap knock-off. I once again sanded down the front but it became very difficult to strip it back down to the original plastic. I then ended up having to use many layers of primer and white paint to cover up the previous colour. This resulted in uneven coats, paint running and layer upon layer of paint being used. None of which are ideal! I didn’t leave long enough in between most coasts of spray. Because the good weather is generally limited in this country I tried to get as much spraying done as possible. This resulted in some coats not being adequately dry, so when sanding down coats I would find the paint would still be soft just under the surface. Maybe with a bit of practice and dry indoor location and plenty of time in between coats the controller might turn out a lot better. As it is this still looks like some sort of 3rd party controller.